Those of you who follow us regularly are are familiar with our gardening trials and tribulations. Trying to figure out Florida soil has been no easy fete! After much research and plenty of impromptu talks with some serious gardeners, we decided dahlias are the answer. These perennial flowers are supposed to be a breeze to grow and are absolutely stunning as they bloom. 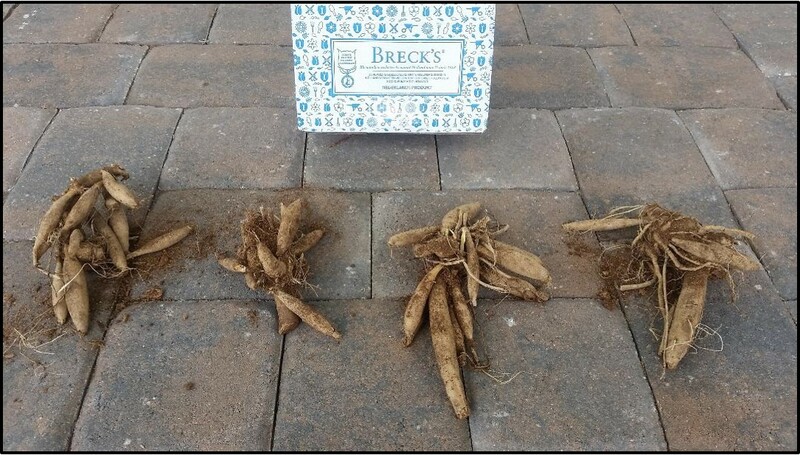 A local florist in our neighborhood recommended planting dahlia bulbs (tubers, actually) and pointed us in the direction of Breck's online shop, which as it turns out, is amazing! We reached out to Breck's to give their bulbs a try and were pleasantly surprised with the wide variety of plants they offer and the wealth of helpful gardening information. Check out our planting photos below! The box was well packaged and arrived with four dahlia root bulbs. The instructions were easy. Dig a shallow hole, put roots in, cover with soil and water! We dug 4 holes, one for each set of tubers. Product Guarantee: Breck's is the largest U.S. importer of Dutch bulbs. Their team in Holland visits growers year-round to inspect and select only the best bulbs for their clients. They stand by their work, too. If you're unhappy with any item, for any reason, they refund the money and replace the item. Plant Finder: This feature is so cool. How many times have you had an idea of what you wanted to plant, but couldn't quite narrow it down? Breck's makes it logical and easy. The plant finder uses filters for 10 zones, light exposure, what color, what height, bloom time, usage, and shipping season. Using your answers, it presents all available plants. Quick Order feature: If you have the Breck's mailer or catalogue on hand, you can use the item number directly off the page to place your order. All you need is the item number (Easy Number), your email for confirmation, and the zip code of where the delivery is being sent. They even take into account discounts via the Offer Code field. We needed something that would grow in the hot humidity of Florida, tolerant of sandy soil, and would grow to a decent size with minimal effort. The dahlias Breck's helped us choose will tolerate these soil types: Acidic Soil, Clay Soil, Loamy Soil, Sandy Soil. We also wanted something that would stand out. The Nenekazi Dinnerplate Dahlia has slender, spiky petals when in full bloom, with an abundance of lovely florets. They start as creamy yellow at the heart, and turn to baby pink at the spiky, eye-catching tips! Space each plant 2 to 3 feet apart and dig a wide whole. Loosen the soil at the bottom of the hole and place the roots, then cover with potting loose potting soil. 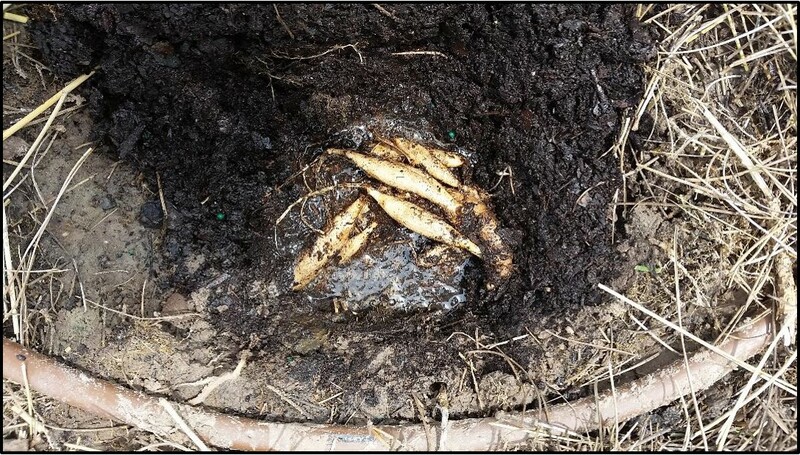 The roots should be about 2 inches below the ground surface. Water generously right after planting, and then ensure they receive a minimum of 1 inch of water each week thereafter. Head over to Brecks.com to browse their selection and place your order. Request a catalog as well! We're so excited to watch these dahlias grow and can't wait for the pop of color they'll add to our garden! Be sure to connect with us on Instagram to check them out throughout the weeks. We also recommend Breck's blog, which has a wealth of information and helpful tips to make your garden a success! Disclaimer: The products in this post were provided by Brecks.com. As always, our posts are our own, honest opinions.